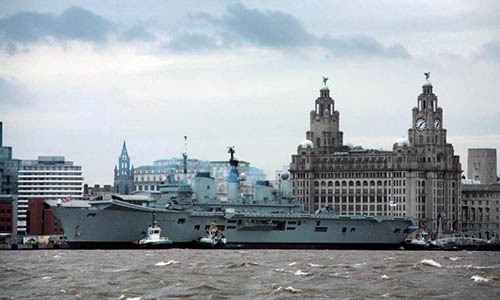 HMS Ark Royal arrives in Liverpool - 15th January 2009. 12th January - Sail from Portsmouth. 15th - 19th January - Visit to Liverpool (includes Ship Open To Visitors). 20th - 25th January - De-ammunition at Glen Mallen Armament Depot. 27th - 28th January - Anchor in Scapa Flow. 29th January - Arrive for a visit to North Shields (includes Ship Open To Visitors). 3rd February - Sail from North Shields. 5th February - Arrive in Portsmouth for a docking period and mini refit. 5th March - 80th birthday party on board in honour of Sir Donald Gosling. 9th March - Enter dry dock. April - Portsmouth in dry dock. May - Portsmouth in dry dock. June - Portsmouth in dry dock. July - Portsmouth in dry dock. 4th August - Flood up and cold move to North West Wall. 4th September - Full ceremonial divisions on the flight deck, Vice Admiral Alan Massey to take the salute, followed by Families Day. 25th September - Sail from Portsmouth for Shakedown and post-maintenance sea trials. 9th - 13th October - Portsmouth for weekend leave and corrective maintenance. 13th October - Sail for further sea trials. 23rd October - Final inspection to formally end the mini-refit. 29th? November - Sail from Portsmouth. 5th November - Commence Basic Operational Sea Training (BOST) at Devonport. 17th December - BOST complete. 18th December - Portsmouth for Christmas leave.